Cesar has been a good customer of ours for over 8 years. 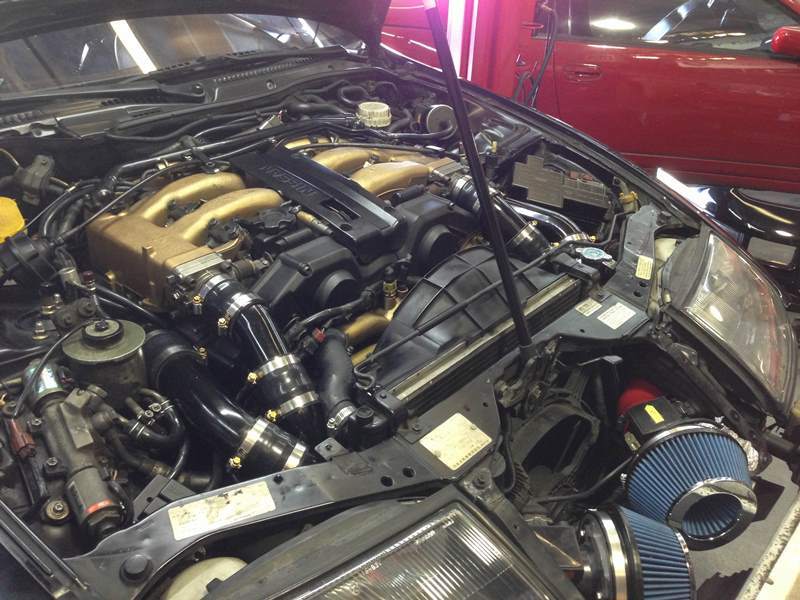 Just this month he had us upgrade his Z32 further by adding Ash Planar Inlet Piping, Ash Intercooler Piping, and Massive Intercoolers followed by a retune. We retained the throttle bodies for this round of modifications. So we’ll get a good sense of what the piping and intercoolers make. 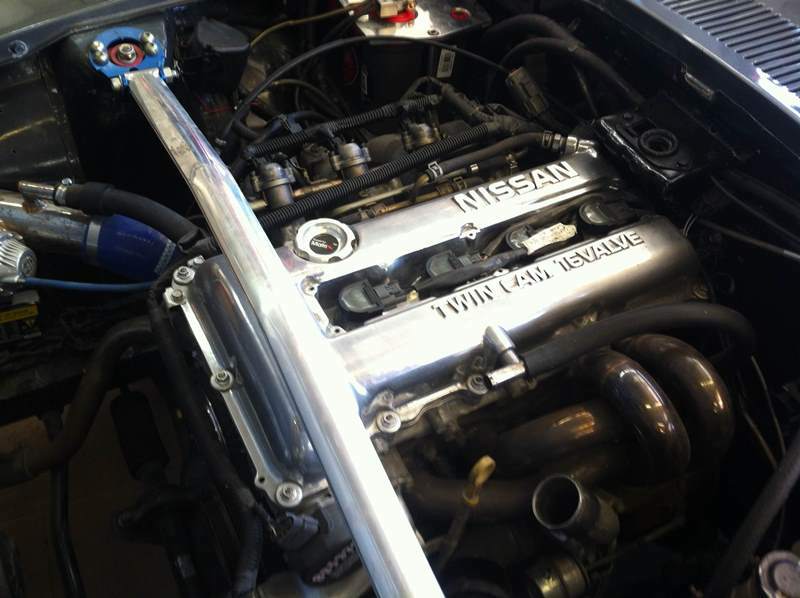 Massives installed, we removed a set of Godspeed Intercoolers that were previously installed on the Z. Piping installed and ready for the bumper to go back on. 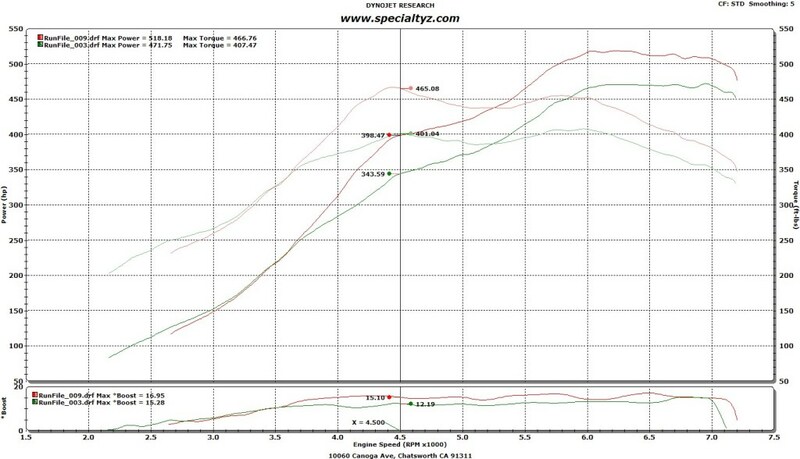 Here’s the 91 octane dyno results that show the difference of before and after. We’re able to get away with slightly more boost and gains are had from 3700+ RPMs. Almost 70 foot pounds of torque at 4500 RPMs. 100 Octane results. Very nice difference all the way around. Boost had a small spike at peak torque and where the plot is laid out at 6500 RPMs you’ll see boost is the same. Right there we gained 60 foot pounds of torque and 74 rear wheel horsepower. Peak numbers were also very impressive. In our last post about Dean M. we had done a few upgrades and talked about the future. Well, the future has come and gone. 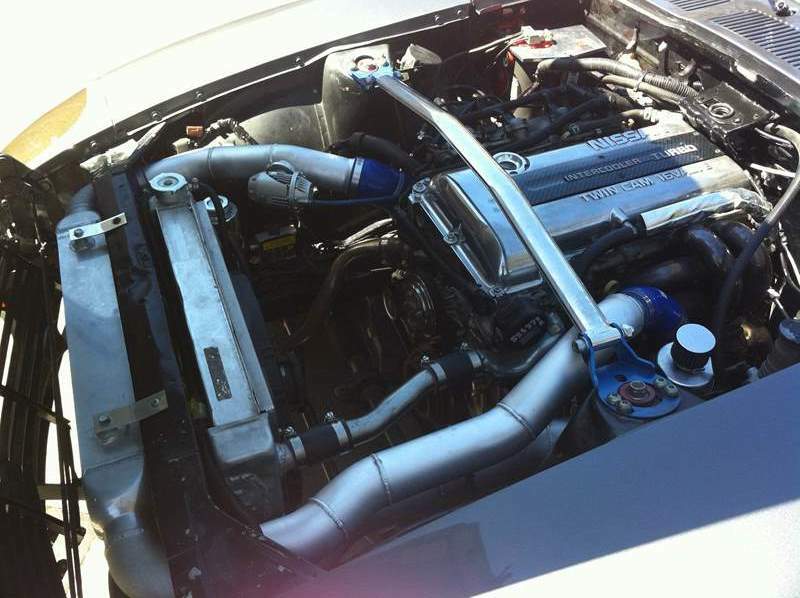 We did add the SZ 3″ 4-Bolt Down Pipes to the existing JWT Sport 500 turbos (still on stock exhaust manifolds), SZ 3″ Aluminized High Flow Cat Pipes, SZ 3″ SS Dual Tip Catback, Ash Intercooler Piping & Massive Intercoolers, Z1 58mm Throttle Bodies, Nismo 740cc Fuel Injectors & 300Degree Fuel Rails. The old Greddy Profec-B was also replaced in favor of the Blitz boost controller. We also went in and replaced any and all parts that were in the way to upgrading. I didn’t take any pictures due to time constraints (again). In any case I think the results were superb from before and after. The before and after on 91 octane. Look at how much more response we gained down low (blue run)! The turbo is able to make more boost from 4200RPM and below. Same thing with 100 octane. The new run (blue) can now more effectively make use of the higher boost pressures. Whereas before power didn’t go up dramatically with the increased pressures. Love the HUGE torque gains! 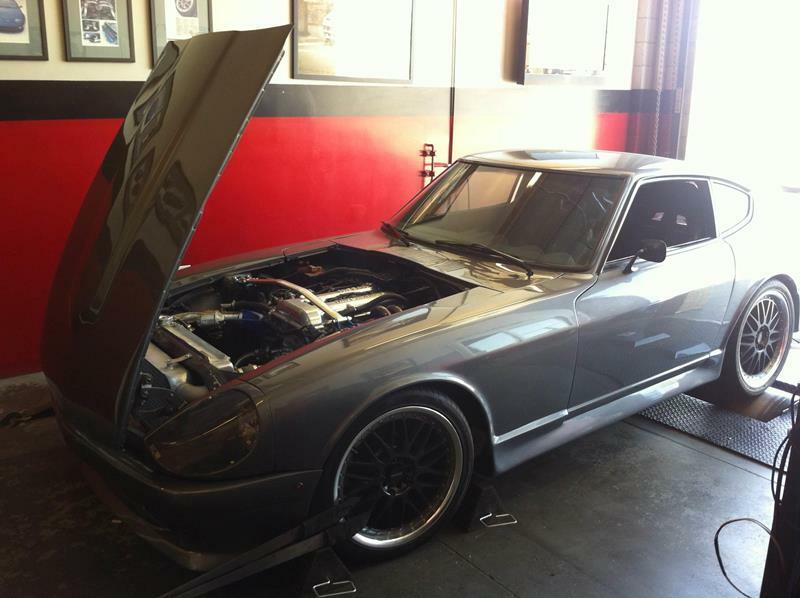 Spike’s 240Z limped its way to us after so many months of poor work from other shops. At first look this Z didn’t have the original inline engine nor did it even have a 6 cylinder in it. Spike had it converted with the “lightweight” SR20DET. 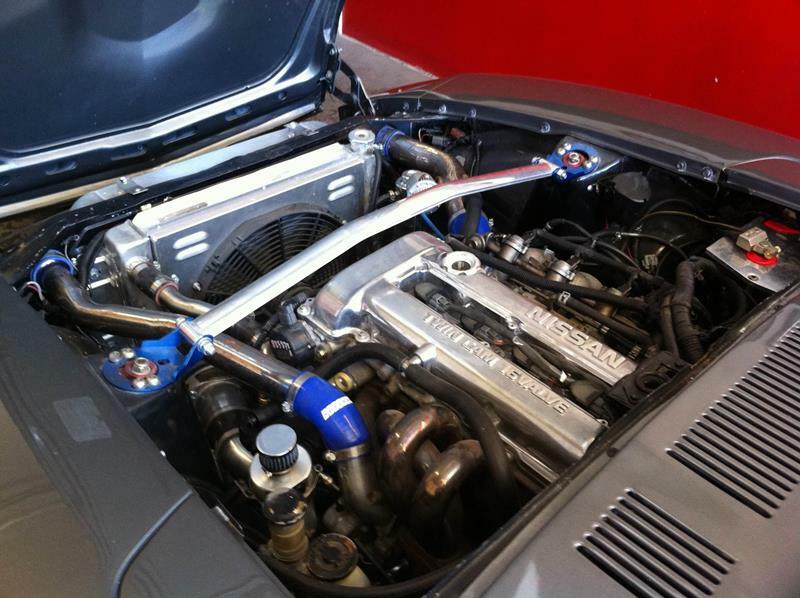 My good friend “Rawb” argues that a 4 cylinder should not inhabit the engine bay of a Z, I disagree in this particular case. Upon arrival we found many issues to work through. For starters the wiring doing for the EFI harness was non-existent so we went to work getting this all squared away (thanks Juan!). 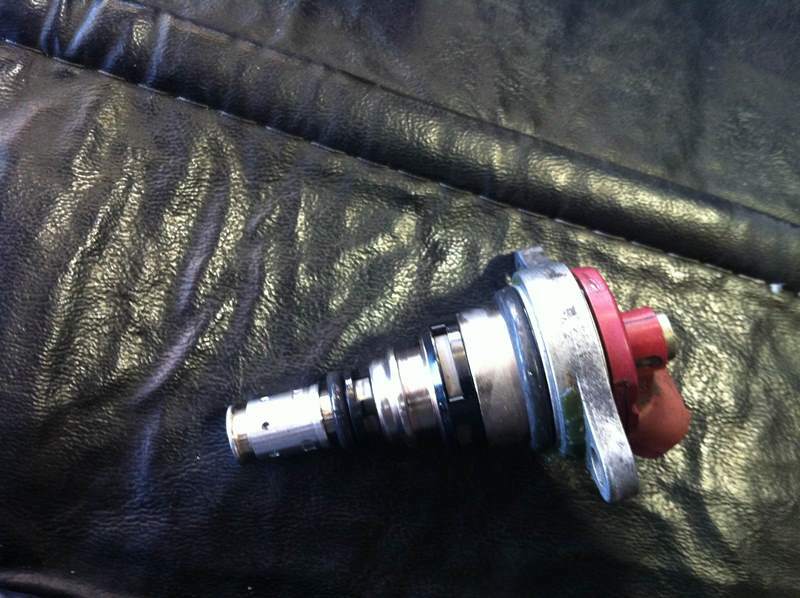 We replaced the old skool HKS injectors in favor of new Nismo 740s. 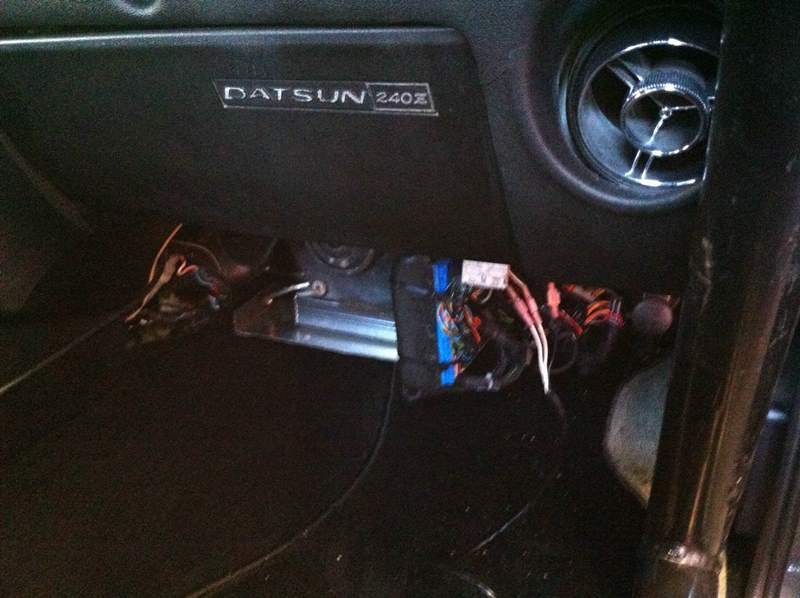 We ditched the Nissan ECU, installed and tuned the PS1000 Haltech. In doing so we got rid of the MAF in favor of a MAP sensor especially since there was an HKS BOV on the Z, added boost control, and the Haltech I\O Box. 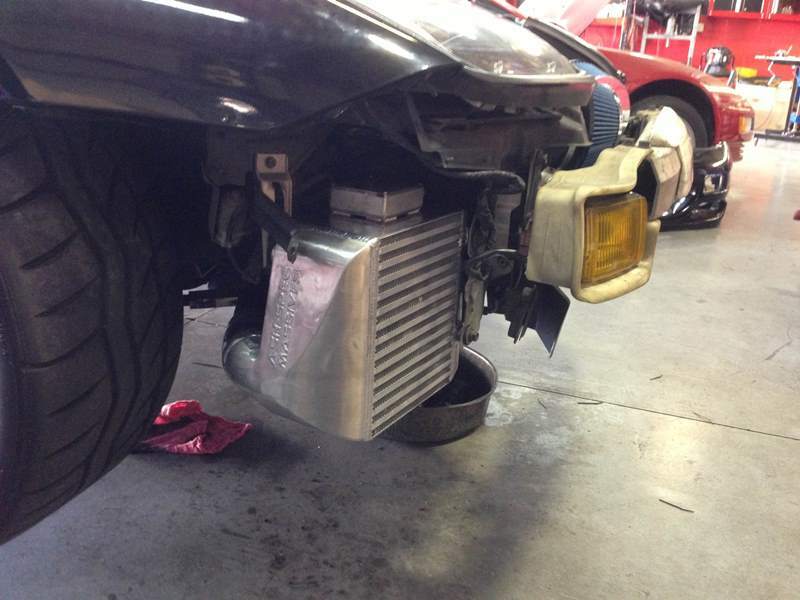 We also had the exhuast changed out for a full 3″ single out and upgraded\replaced the inlet and intercooler piping. The air filter was moved out away from the engine bay and up front in the bumper area. The SR retained the factory turbo. Part of inlet and outlet piping disassembled ready for upgrading. We added a catch can and insulated\wrapped the breather hose running near the exhaust manifold. A shot of some of the old crush bent intercooler piping that was also undersized. The Haltech ECU tucked away. Here’s the upgraded intercooler piping. We had it made in lightweight aluminum along with the inlet piping. There was no way we could get a baseline pull on the Z when it came to us due to poor running, we tuned the Z first on low boost, the old intercooler and inlet piping, and old 2.5″ exhaust. 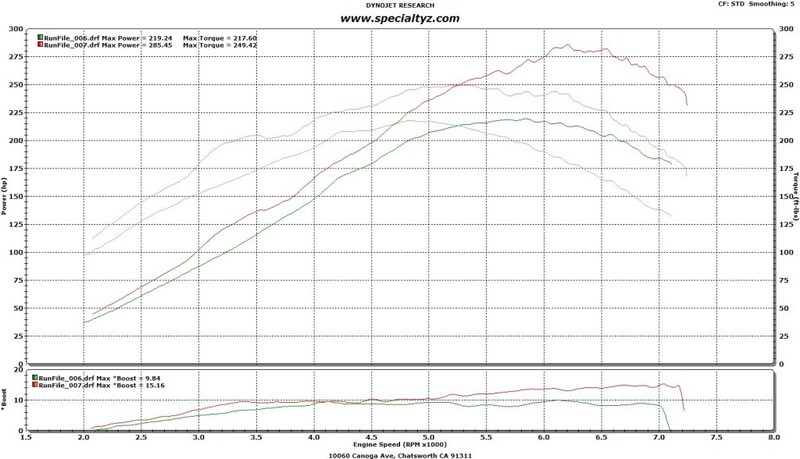 This netted us 219 whp at 9 psi and a drivable car (green run). 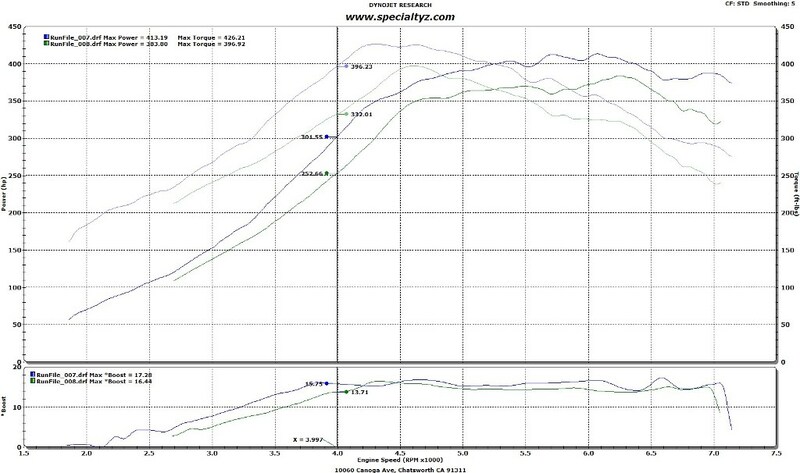 Once the upgrades to the intercooler, inlet piping, and exhaust were done we retuned for higher boost. 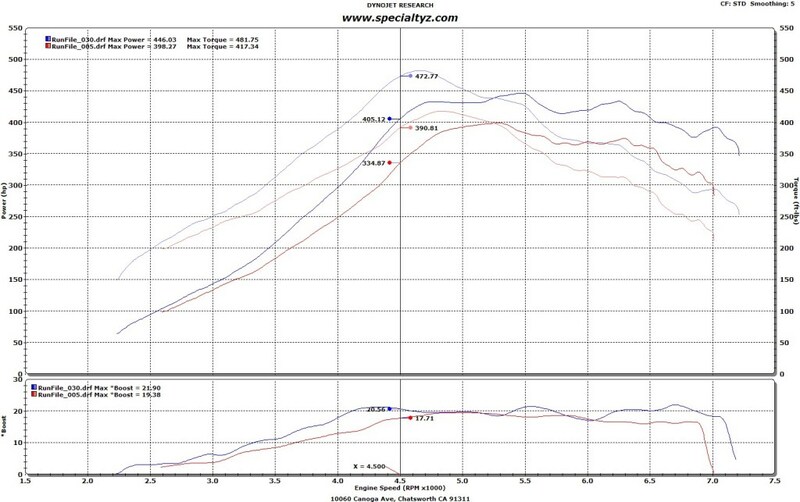 285 whp on 15 psi (stock turbo) and 91 octane. The stock turbo is the biggest restriction on this engine now that the breather mods have been done. 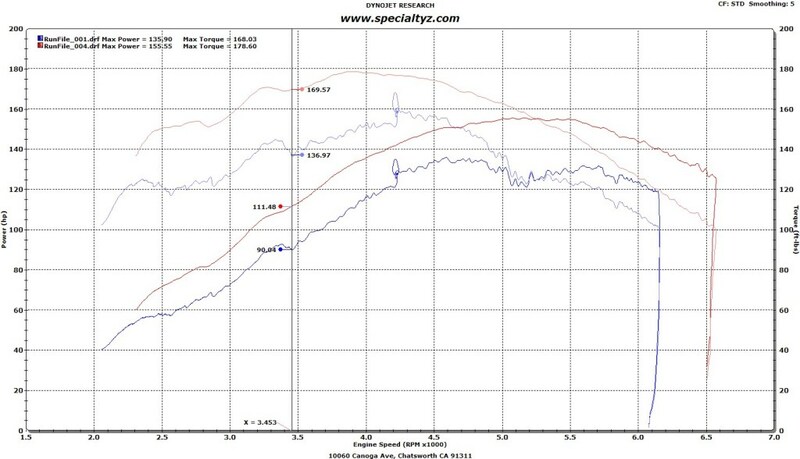 You can see it boost creep at the higher RPMs, the wastegate flapper door can’t let enough exhaust out. Every vehicle is in need of some sort of help and here at SZ we are willing to help those who need it. SZ’s very own LJ needed this and more. 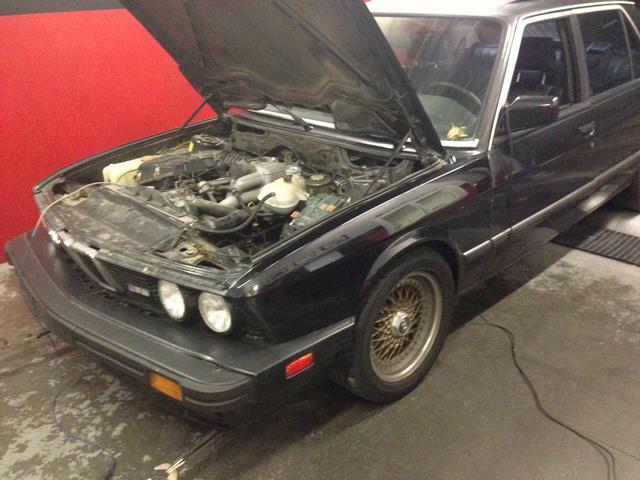 His vehicle comes in the form of an 88′ BMW 535, 3.5 liter inline-6. Many months ago we dynoed it to get a base line and were horrified with the outcome. The engine struggled to make power and ran extremely lean. Lean enough to melt pistons. LJ and I put our heads together and modified his Bosch Motronic ECU to give us the ability to tune it. Before we did this, the air flow meter (flapper door style) was tweaked to help get mixtures a tiny bit closer. 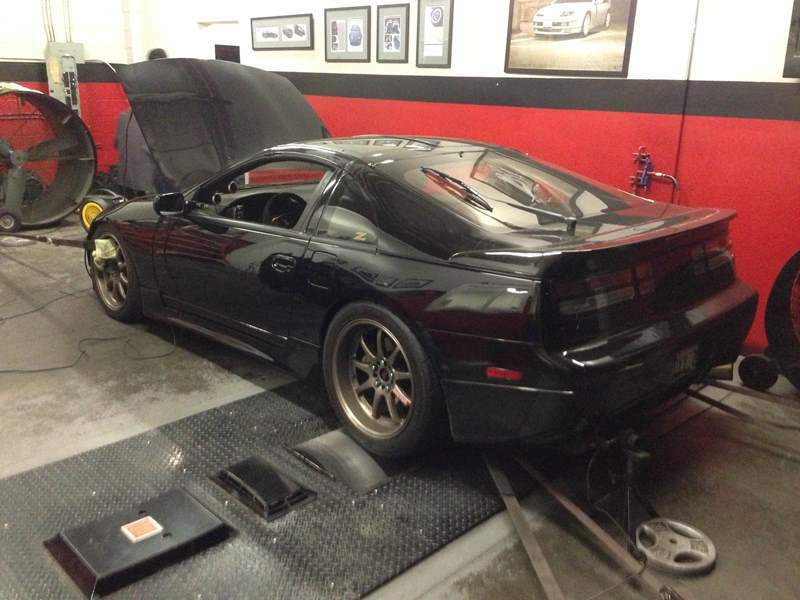 While on the dyno we fabbed up a way to install a Z32 POP Charger to remove the factory air box. We will later on down the road install a heat shield for the filter. The baseline in blue. Just terrible. Look at how choppy the graph is. It struggled many many years this way. 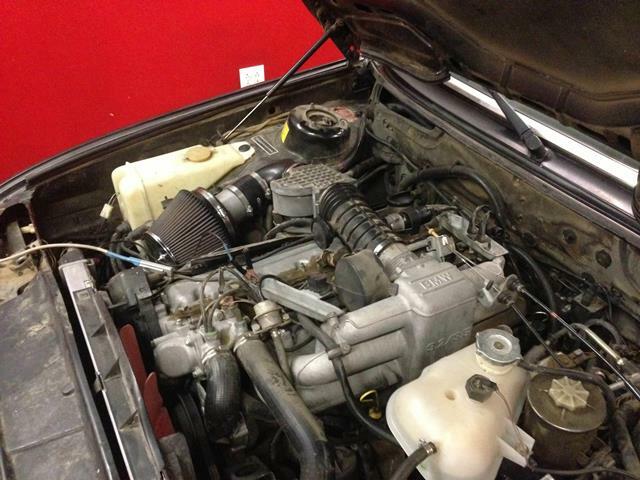 Once we got our hands on it we had this inline engine purring and making alot more power! 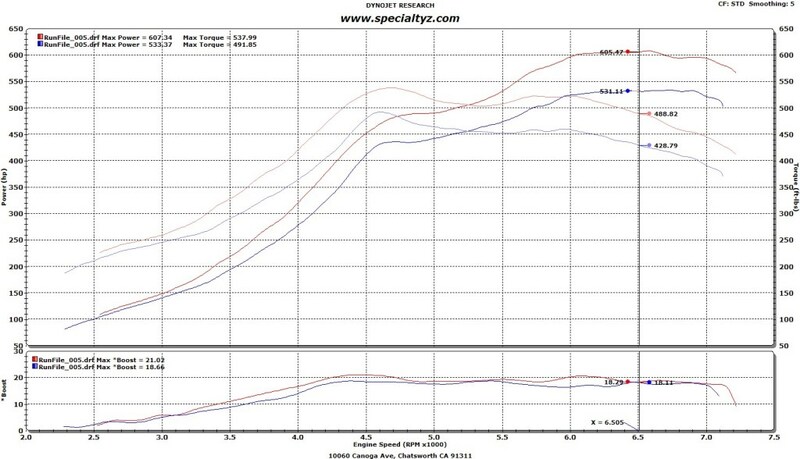 See the difference on the tuned run (red). Needless to say this is an entirely different car to drive.